Weather and climate varies greatly over the Grand Canyon, by location as well as season, owing to the vast size and topographical diversity of the national park, which extends for a distance of 120 miles west to east and 70 miles north to south. But the elevation has the most influence on the weather - terrain in the park ranges from arid deserts at 1,400 feet, around the east end of Lake Mead, to the high, forested land of the Kaibab Plateau (over 9,000 feet), where snow lays on the ground for eight months of the year. 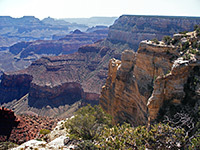 Descriptions and averages are given for the South Rim, North Rim and the inner canyon (Phantom Ranch). The South Rim of the Grand Canyon is also the north edge of the Coconino Plateau, a flat, partly wooded expanse that receives a fair amount of snowfall for several months in winter (November to February), though the main roads and all park facilities remain open 365 days a year. 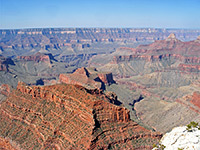 Winter and early spring may see several days at a time of dull, foggy weather when much of the canyon below is hidden by low cloud, yet the park also experiences many beautifully clear, crisp and sunny days. Temperatures fall well below freezing at night but even in midwinter the afternoon sun usually warms the air at least to the 40s (F); combined with the low visitor numbers during this period, a trip to the canyon during a settled spell at the end of winter can be very peaceful and rewarding, and a good time (if suitably equipped) to attempt the longer rim to river hikes. Winter storms can appear quickly, however, producing blizzard conditions on a previously calm and clear day. South Rim weather remains on the cool side well into March, but the temperatures steadily rise by around 10°F per month until the hottest time of July, when the average high is 84°F. Spring is often quite a windy season, and wet at first, but late spring is the driest time of the whole year. This dryness means that the humidity is low hence nighttime and early morning temperatures can still be cold, with frost (and snow) quite possible any time in May. Although midsummer can be described as hot, the relatively high elevation means that, in contrast to many other places in Arizona, only twice in the last hundred years has the temperature on the south rim exceeded 100°F, on July 11th 2003 and during June 1974. Late summer thunderstorms (often short, severe, accompanied by hail, localized flash floods and very strong winds) are usually succeeded by several weeks of still warm weather, often clear and calm, and also quieter as the peak visitation season ends in September. This is followed by a rapid cooling during October and especially November, when the first frosts and snowfall are likely. The lower temperatures and impending snow cause the main NPS facilities at the north rim (including all lodging and camping) to shut in October, though the one entrance road AZ 64 remains open a month or so later, closing only after the first major snowfall - usually towards the end of November, when nighttime temperatures start to drop well below freezing. Between 50 and 100 inches of snow falls each winter, with most precipitation, and the coldest weather (some nights are below 0°F), occurring during January and February. Once the road is closed, it is not accessible again to public vehicles until the park facilities reopen in mid May, even though all snow on the highway may be long gone. People on foot, skis or snowshoes may still enter the park at any time during the winter, however. By the time of the north rim opening in May, despite the nights being still around freezing or below, days can be very pleasant, especially in the afternoons on windless days when the temperatures warm to the 60s or even 70s, and hiking in shorts and t-shirt is quite possible. Steady warming makes June and July the hottest months of the year, but the last patches of snow deep in the forest and on steep, north-facing slopes do not melt until the middle of summer. Maximum temperatures at the north rim rarely rise much above 80°F, and sub 32°F temperatures (and snowfall) have been recorded in every month. Compared to the south rim, as the north rim is on average 1,300 feet higher in elevation, the mean temperatures are always lower, by about 5°F. The north rim is even more prone to late summer thunderstorms, owing to the extensive high country of the nearby Kaibab Plateau. Few Grand Canyon visitors get to see the Colorado and the inner canyon gorge - either by taking the long trails from the rim, or rafting down the river - but those who do encounter a desert-like environment with barrel cacti on the canyon walls, little rainfall, and high temperatures all year. 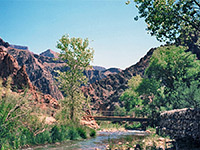 The only riverside location with any structures or facilities is Phantom Ranch, at the junction of the North Kaibab, Bright Angel, and South Kaibab trails; this has an elevation of 2,450 feet, about the same as the Sonoran Desert city of Tucson, and experiences similar if slightly more extreme conditions - cooler in winter, a little hotter in summer. A maximum of 120°F has been recorded at Phantom Ranch in July and August, though most summer days see temperatures just a few degrees above 100. In winter, cold air and sometimes thick fog sinks into the canyon and becomes stationary, keeping temperatures low, though frost and snow occur only rarely along the river corridor. The cool conditions lessen quite quickly, and the Phantom Ranch area usually reaches 60°F in February and 70°F in March, becoming hot by May when the first 100°F temperature of the year is usually recorded. The summer months are generally too extreme for hiking from rim to river, except for seasoned desert hikers. The mean temperature exceeds 90°F for nearly half the year (149 days). By early October though, conditions along the river are pleasant once more, often sunny, dry and calm, with a maximum of 85°F.